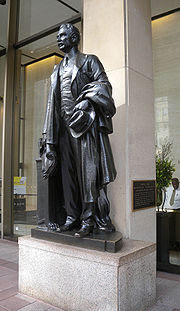 Herewith a nomination for our most hideously vindictive piece of public statuary, the Samuel Rea monument in Manhattan's Penn Station. The 1910 sculpture by Adolph Weinmann is fine enough. What makes it unbearably cruel though, is the backstory. Samuel Rea had been working for the Pennsylvania Railrod since he was 16. He rose up in the company, and under his Vice-Presidency glorious Old Penn Station was completed in 1910, the crowning achievement of American architectural trinity McKim, Mead and White. Rea's likeness, and that of a previous railroad President Alexander Cassat (brother of painter Mary Cassat), were installed in niches of the newly built architectural wonder. When Rea assumed presidency of the Railroad two years after the station's completion, it was his job to defend this superb American accomplishment from those who called it a wasteful extravagance. Rea succeeded. Visually speaking, we can imagine this was not that hard to do. But the conceits of architectural modernism combined with the triumph of the automobile (which had supposedly "eclipsed" the train), led inexorably to the destruction of Old Penn Station in 1963, resulting - because trains turned out to be not so outmoded after all - in our freakishly hateful present replacement. The new Penn Station brings certain Bible verses to mind. As Vincent Scully famously remarked, "One entered the city like a god. Now one scuttles in like a rat." Other worthies testify to their extreme dissatisfaction as well, hoping for the success - may it be granted! - of Moynihan Station. I spend a lot of time at the current Penn Station, and I often see people screaming and fighting, cursing and hitting each other. Would the old terminal have prevented such spiteful behavior? Not necessarily, but I wouldn't rule out the fact that overwhelming grandeur has an ameliorative effect on public behavior. And yet, as disturbing as it may be, there's something appropriate about snubbing one's neighbor in such a hellish setting. New Penn Station makes it feel right to be rude. Following the destruction of Old Penn Station, the two aformentioned statues were preserved and placed on the new sight. Alexander Cassatt has since been mercifully removed, but not Rea. He is there today, and every day, forced to witness our undoing of his life's work. Once his likeness looked upon Roman grandeur, now it stares at an ATM console. Decades have passed - he cannot look away. Had I the choice between this fate and eagles picking at my regenerating intestines for all time, I'd be on the fence.